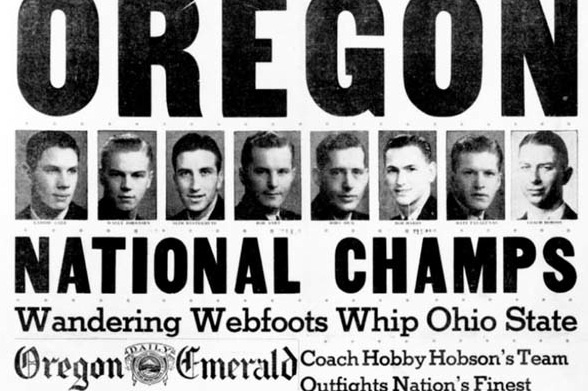 Oregon’s 1939 national championship team, the “Tall Firs,” went 6-8, 6-4, 6-4 across the front line. I would have dominated back then. Just 35 programs can claim to have won the national championship in men’s basketball, and one of them isn’t even in Division I anymore. Oregon won the first NCAA tournament in 1939 and hasn’t won a title since. Get on the stick, Dana Altman. CCNY, I salute you! In 1950 the Beavers became the only team to win the NCAA and NIT tournaments in the same season, but scandal enveloped the program the following year when it was revealed that several players had shaved points during the 1949-50 regular season. Today CCNY plays in Division III. The most forlorn current program with a national title to its name is either Holy Cross or Loyola. The Crusaders haven’t won an NCAA tournament game in 60 years (though they put good scares into Kentucky, Kansas, and Marquette in the 2001, 2002 and 2003 rounds of 64, respectively). The Ramblers closed out their Horizon League career with a six-year sub-.500 streak. Maybe the move to the Missouri Valley to backfill Creighton will help their fortunes. Lastly, it’s pretty amazing to think that in 1998 Utah came within 40 minutes of creating a list that would have looked like this: UCLA, Kentucky, Indiana, North Carolina, Duke, Connecticut, Kansas, Louisville, Cincinnati, Florida, Michigan State, NC State, Oklahoma State, San Francisco, Utah. There is some degree of overlap between the fan bases of the University of Illinois and the Chicago Cubs. Every day I wake up and thank my lucky stars that I belong to just one of those fan bases. BONUS 1950 note! Texas Western’s 1966 title is remembered and celebrated for the blow it struck for equality, as the Miners started five African-Americans and defeated an all-white Kentucky team in the title game. (Rick Majerus once said the greatest compliment he ever received was when Don Haskins told him during Utah’s 1998 tournament run: “Son, you play defense the way we used to.”) Alas, that battle that was fought in college basketball for a long time. When UK played CCNY in the second round of the 1950 NIT, several Wildcats reportedly refused to shake hands with a Beaver starting lineup that featured two African-Americans and three Jewish players. CCNY won 89-50, and the Kentucky state legislature considered a motion to fly the flag over the capitol at half-staff. Aren’t those first two lines also the chorus in “Across the Universe”? So that’s where John Lennon got that. This entry was posted in florid historical references, hoops on November 19, 2013 by johngasaway.